Laura Ingalls Wilder's Little House on the Prairie books about pioneer life on the 19th-century frontier inspire a step back in time to a simpler, charming yet hardworking world. Pioneer costumes are easy to create with a purchased pattern, cotton calico and muslin fabrics. The reality of pioneer life on the Great Plains and in the farmlands of the Midwest meant women and girls spent a lot of time working in the sun. Long-sleeved dresses and sunbonnets protected the skin; pioneer dresses were usually made of inexpensive, sturdy, washable cottons with long skirts and long sleeves. 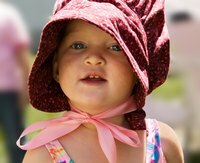 A sunbonnet provided shade and is an indispensable part of a Laura Ingalls costume. Pioneer outfits are also available online. The costume components of a long dress, apron, bloomers and bonnet may also be found in thrift stores. Using the measuring tape, take the bust, waist, hip and neck-to-waist measurements of the person for whom you are making the pioneer outfit. Purchase a pioneer costume pattern from a fabric store. The guide on the back of the pattern envelope tells how much fabric is needed for each costume size, along with what notions you will need, such as thread, interfacing and buttons. For authenticity, use cotton calico, gingham check, rustic 19th-century prints or plain, unbleached muslin. Pioneers such as the Ingalls family often had to make do and recycle material from spare fabric items and old pieces of clothing. Old clothes from the attic or thrift store may be cut up and used for this costume. Pre-wash and dry the fabrics. Following the pattern directions, lay out the fabric, place the pattern on it and pin the appropriate pattern pieces in place with straight pins. Cut out the fabric pieces and set aside. Mark the locations of the darts, buttonholes and other details with tailor's chalk or a washable marker. Pin the fabric pieces together (usually with right sides facing), as directed on the sewing instructions. Follow the directions to construct the pioneer dress using a sewing machine. For authentic closures, sew on buttons and buttonholes. Add lace to the collar as per the pattern instructions if desired. The bonnet brim will need a stiff interfacing to keep its shape. There are two types of interfacing: fusible, which can be attached to the fabric by ironing it, and non-fusible, which is sewn in place. Either works well -- choose the type you prefer to work with. For authentic accessories, don the sunbonnet and an apron as well. Boots or plain slip-on shoes complete the outfit. Add a basket filled with a rag doll, a tea towel-wrapped loaf of bread or fruit for country charm. A daisy chain or tiny bundle of tied wild flowers or herbs pinned to the dress make a sweet accessory. Laura Ingalls greatly enjoyed going to school; a personal chalkboard or slate and chalk make another authentic accessory, as could a few schoolbooks. Sometimes the only book a pioneer family owned was a Bible, so a small Bible could also be carried. Another nice accessory would be a bundle of wildflowers tied together with twine and wrapped in a cone of brown craft paper. Girls and women in the Laura Ingalls Wilder books had basic hairstyles, often simple braids or updos. They wore little if any makeup and had a fresh, natural look from their hard work and time spent outdoors, so little girls should steer clear of makeup for this costume, and women should do very naturalistic makeup, if any. Ribbons for the hair were a luxury and were much loved by young girls. Pioneer women and children often wore their dresses until they were quite worn out, and kids often wore hand-me-downs, so the costumes may be made a little bit large, especially for the children. Don't worry too much about having a nicely fitted garment. Drawstring pantaloons or bloomers are another authentic touch, but with the long skirts, they are not necessary. Be sure to remove all pins from the costume.